To suppress the host’s immune response in order to facilitate survival, growth, invasion, and metastasis of malignant cells, cancer cells use the indoleamine 2,3-dioxygenase (IDO) and tryptophan 2,3-dioxygenase (TDO) pathways. IDO enzymes and IDO-related enzymes are active in many tumors, providing a direct defense against T cell attack. IDO is also active in many antigen-presenting cells, resulting in peripheral tolerance to tumor-associated antigens. Key enzymes involved in this and related pathways include IDO1 enzyme, IDO2 enzyme, TDO enzyme, tryptophan hydroxylase 1 and 2 (TPH1 enzyme and TPH2 enzyme). The mechanism of IDO and TDO suppression of tumor immunity involves both tryptophan (Trp) depletion and synthesis of immunosuppressive metabolites, such as kynurenine (Kyn). Trp is an important and essential amino acid that has a variety of functions within the cell. Cancer cell-expressed IDO1, IDO2, or TDO catalyzes the first and rate limiting step of the Kyn-Trp degradation pathway. The two IDO isozymes, IDO1 enzyme and IDO2 enzyme, are normally involved in the metabolic breakdown of the amino acid tryptophan. IDO enzyme expression also directly activates the regulatory T cells that shut down the immune response, which amplifies the suppressive effect. Immune checkpoint research – IDO1 and TDO enzyme catalyze the conversion of Trp to Kyn. As shown above, IDO1 and TDO enzyme catalyze the conversion of Trp to Kyn. Depletion of Trp and increased levels of Kyn in the tumor microenvironment combine to produce an inhibitory signal in T cells that prevents them from attacking the cancer cell. Inhibition of IDO1 enzyme and/or TDO-catalyzed Trp catabolism relieves the immunoinhibitory microenvironment. Immune cells that are largely responsible for tumor immunity, cytotoxic T cells (CTL) and natural killer (NK) cells are acutely sensitive to Trp depletion, and lowered Trp levels leads to decreased CTL and NK cell proliferation and activation. Additionally, the Trp metabolite, Kyn, can induce T cell differentiation into FoxP3+ regulatory T cells, which further suppresses the host immune system. All of this facilitates survival, growth, invasion, and metastasis of malignant cells4. IDO pathway inhibitors, including NLG919 and INCB02460 can prevent this immunosuppression and allow the activation of immune cells that recognize and fight the cancer cells in pre-clinical models5,6. A number of IDO and TDO inhibitors have now advanced to clinical trials. Despite their promise, it remains unclear what off-target effects IDO and TDO inhibitors may have, as Trp is not only catabolized by IDO and TDO. Two other important enzymes, TPH1 enzyme and TPH2 enzyme, are involved in Trp catabolism via a pathway that ultimately leads to the synthesis of serotonin and dopamine, two important neurotransmitters. Given that IDO, TDO, TPH1, and TPH2 enzymes share Trp as a substrate, it may be wise for drug developers to test for IDO/TDO inhibitor cross-reactivity against TPH1/2. Indeed, there is preclinical evidence that suggest inhibiting TPH enzymes can also relieve immunosuppression. Additionally, IDO/TDO pathway inhibitors may drive tryptophan catabolism via the TPH pathway. Substantial research efforts have focused on the identification and development of inhibitors of the various Trp catabolic enzymes. Screening for IDO or TDO inhibitors is possible with BPS Bioscience’s IDO1 stable cell line, IDO2 stable cell line, TDO stable cell line and IDO and TDO cell-based assay kits. These kits are easy to use and provide researchers with tools to screen for IDO and TDO inhibitors in a cellular context. IDO1 (left) and TDO (right) activity in IDO1 and TDO Cell-Based Assay Kits. Demonstration of IDO1 (left) and TDO (right) activity in BPS IDO1 and TDO Cell-Based Assay Kits. Conditions in each graph from left to right: Media only, untransfected HEK293 cells, IDO or TDO transfected HEK293 cells plus QuickDetect™ supplements, IDO or TDO transfected HEK293 cells plus QuickDetect™ supplements and the indicated inhibitor. 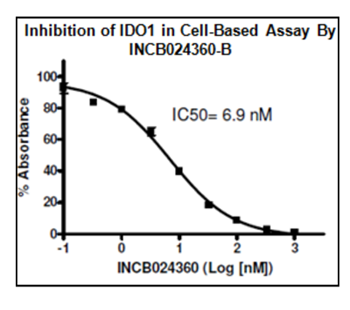 This specific BPS cell based assay can also help you to determine IC50 of your target compound on the IDO1 or TDO enzymes as seen with INCB024360-B compound. By providing stable cell lines, robust cell based assays and specific reagents, BPS Biosciences offer a comprehensive range of tools for you to investigate new targets, such as IDO/TDO enzymatic pathways, to develop new treatments in Immunotherapy and Cancer research. There are also numerous other IDO and TDO products available for your immunotherapy research and experiments, also available through tebu-bio in Europe. 1. Platten, M., et al., “Tryptophan catabolism in cancer: beyond IDO and tryptophan depletion.” Canc. Res. 72.21 (2012):5435-5440. 2. Platten, M., et al., “Cancer Immunotherapy by Targeting IDO1/TDO and Their Downstream Effectors.” Front. Immunol. 5.673 (2015). 3. Stavrum, A-K., et al., “Model of Tryptophan Metabolism, Readily Scalable Using Tissue-specific Gene Expression Data.” J. Biol. Chem. 288.48 (2013). 34555-34566. 4. Munn, D.H., and Mellor, A.L. “Indoleamine 2,3-dioxygenase and tumor-induced tolerance.” J. Clin. Invest. 117 (2007):1147-1154. 5. Liu, X. et al., “Selective inhibition of IDO1 effectively regulates mediators of antitumor immunity.” Blood. 115.17 (2010):3520-3530. 6.Pilotte, L. et al., “Reversal of tumoral immune resistance by inhibition of tryptophan 2,3-dioxygenase.” Proc. Nat. Acad. Sci USA. 109.7 (2012):2497-2502. 7.Nowak, E.C., et al., “Tryptophan hydroxylase-1 regulates immune tolerance and inflammation.” J. Exp. Med. 209.11. (2012):2127-2135.